EMAG, a worldwide leader in manufacturing systems for precision metal components, will showcase the VL 3 DUO, a compact machine used for the production of gear wheels. IMTS will be held September 10-15, 2018 in Chicago. EMAG will be in the South Hall Booth 339436. 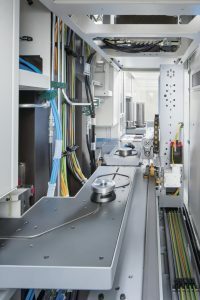 When EMAG launched the new TrackMotion automation system in 2015, it quickly became apparent that it not only focused on transporting parts, but on the perfect combination of machine tool, raw parts storage facility and a standard automation solution to create a highly efficient production line. The consistent adjustment of the automation to the modular machines from its internal production makes it possible to create manufacturing systems using a modular kit. EMAG is now unveiling another world first, a direct development of the modular machines in combination with the TrackMotion automation system – the VL 3 DUO. When you first see the machine, you’ll immediately notice how compact it is. “We need just 13 m² (140 sq ft) to install the complete VL 3 DUO,” explains Andreas Frank, Product Manager for Modular Standard Machines at EMAG. “For a twin-spindle vertical pick-up turning machine, that is a fantastic size. Even if the machine is combined with a raw parts storage facility and the TrackMotion automation system, the dimensions for a complete manufacturing system for chucked parts up to 150 mm (2 in.) is almost laughably small. That makes the VL 3 DUO one of the most compact and efficient systems available from EMAG,” says Andreas Frank, glowing with pride. What the Product Manager is saying becomes apparent when we look at the VL 3 DUO in detail. The VL 3 DUO can be fitted with EMAG’s TrackMotion automation system as an option. The automation system consists of three central parts, the track (i.e. the rails) on which the TransLift NC gripper runs and the raw parts storage facility. The entire system is very compact and runs directly behind the machining areas of the VL 3 DUO. The TrackMotion always focuses on the individual component. Each transport process only moves a single component which allows for significant benefits for component management. The increased mobility of the TransLift, including the Z-axis, means that stackable pallets can be used on the raw parts storage facility, making it possible for the raw and finished parts to be stacked with minimal space requirements. In addition, the TransLift is also used as a changer between the two machining operations. This means that the TrackMotion automation system provides everything required for compact manufacturing on the VL 3 DUO: an extensive parts storage area that accommodates up to 400 parts and a fast, flexible parts transport system between the various manufacturing stations. Like every modular machine, the VL 3 DUO has its own parts buffer and a pick-up spindle in each machining area. The TrackMotion automation system loads the individual part pallets on the parts buffer as they shuttle between the loading position near the machining area and the rear section of the machine. From there, the working spindle takes the raw part, transports it into the relevant machining area and places the part back onto the appropriate pallet after it has been machined. Immediately next to it, the subsequent part is waiting to be picked up by the spindle, so that only a few seconds pass until the next part is being machined. The machining areas are arranged in a mirror constellation and each has its own working spindle which, with a rating of up to 18.1 kW and torque of up to 142 Nm, has plenty of power for high speed, precision machining. In addition, each machining area has a tool turret with twelve tool positions which can be fitted with turning tools or driven tools. “The turrets can also be fitted with an additional Y-axis to extend the range of uses of the machine even further,” explains Frank. 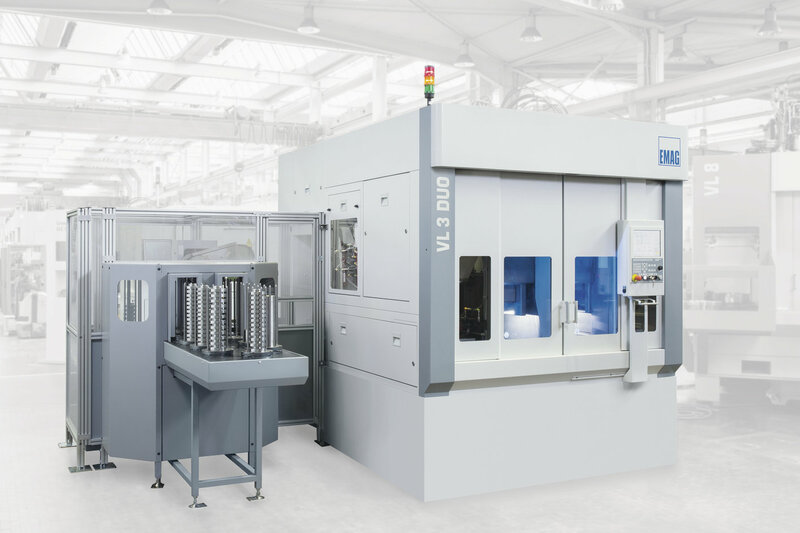 The VL 3 DUO adds a highly productive, compact manufacturing system for large-scale production to EMAG’s modular machine family. “Its real strength can be seen when it is connected to other machines in the modular machine family,” continues Frank. “Let’s look at the example of gear wheel production mentioned above. 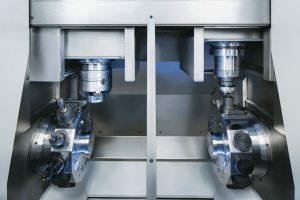 If we supplement the VL 3 DUO with the VL 4 H, the modular gear hobbing machine from EMAG KOEPFER, and a VLC 100 CC or VLC 100 RC, the vertical chamfering and deburring machines, we create a manufacturing system for gear wheels which is completely linked using the TrackMotion automation system, with a very small footprint. The whole thing is made possible by the standard structure of the modular machines, the integrated automation system and the fact that the transfer height between the machines is always identical – it’s simply brilliant! In other words, almost as simple as using building blocks,” says Andreas Frank in conclusion. Visit EMAG at IMTS 2018, South Hall Booth 339436.